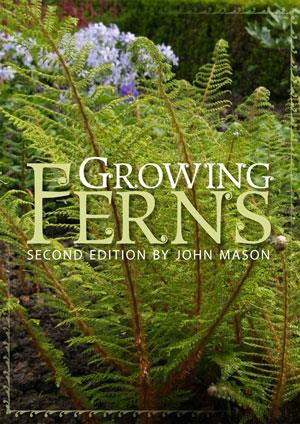 The Growing Ferns ebook, second edition, is a valuable reference book for fern enthusiasts. This ebook covers everything you need to know about culture, propagation, pests, PLUS a directory to hundreds of fern varieties. Learn and understand more about Ferns. Whether you are a home garden or a horticulture professional, this ebook has something for everyone. Heavily illustrated with stunning colour photos, 158 pages. See below for an extract. To most people ferns are very graceful and lush and invoke an image of coolness, calmness and peacefulness. Though lacking flowers they have enormous variety in plant size and form and in the texture, shape and color of the fronds. Ferns are very adaptable and can be grown in a wide variety of situations. While most prefer moist, shaded conditions there are ferns that are suited to open sunny positions, growing naturally in rocky crevices, exposed coastal cliffs, high on living tree trunks or on fallen trees, in alpine bogs, even in semi arid areas. Some species of ferns are tiny with fronds only one cell thick, others can reach a height of 15m or more. Some ferns will spread to form huge colonies, while others will grow like climbers. It is a real treat to find small pockets of ferns in areas you would not expect and to find much rarer species than you thought could be available. The identification of ferns is full of contradictions. Many of the experts throughout the world have conflicting viewpoints on what different ferns should be called. The information on fern varieties in this magazine attempts as much as possible to use the botanical names most commonly accepted. Psilotopsida, Lycopsida, Equisetopsida – fern allies. Most ferns are shade loving plants of moist places. There are exceptions though, and fern species can be found in most environments across the world, except the absolute extremes of desert and arctic areas. There are 10,000-12,000 species of ferns throughout the world. They are widely distributed globally with the greatest species concentration in the humid tropics where the environment is ideally suited for ferns and their need for moist/wet environments. Some species of ferns are tiny, while others can reach a height of 40 ft. Ferns are identified largely by the shape of their fronds or leaves. Fronds can be strap like or undivided, or feathery in appearance like many of the palms (ie. divided). Fronds are described as being 1, 2 or 3 pinnate according to the degree to which a single frond is divided into smaller "leaflets". A 3 pinnate frond will have a much finer texture and smaller leaflets than a 1 pinnate frond.